Speaker Ryan will talk about the sense of urgency that our party should feel in such a consequential election. He will offer a sharp contrast with the failed progressivism of the last eight years. The Speaker will call for a contest of ideas this fall and talk about the better way that Republicans are offering the country. He will also argue that we can make the changes we need only with Republican majorities in Congress and Donald Trump in the White House. And finally, the Speaker will make a call for unity, not just as Republicans but as a country as well. The aide was spot-on. 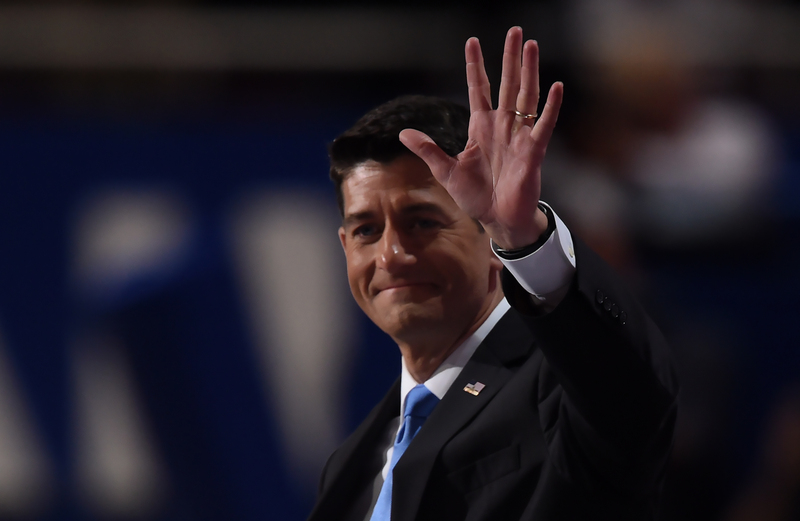 Ryan, who was the GOP vice presidential nominee back in 2012, has struggled to reconcile his initial opposition to Trump with his desire to unite the Republican Party, and his speech on Tuesday made that even more evident. Delegates, friends, fellow citizens. I can't tell you how much I appreciate the privilege of addressing this 41st convention of the party of Lincoln. And as part of my chairman duties, let me thank all of the people of this beautiful city for looking after us this week. And above all, above all, I want to thank the men and women who are here from law enforcement for your service. You know, standing up here again, it all has kind of a familiar feel. Students of trivia will recall that last time around I was your nominee for vice president. It was a great honor. It was a great honor even if things didn't work out quite according to the plan. Hey, I'm a positive guy. I found some other things to keep me busy. And I like to look at it this way — the next time that there's a State of the Union address, I don't know where Joe Biden or Barack Obama are going to be, but you'll find me right there on the rostrum with Vice President Mike Pence and President Donald Trump. Democracy is a series of choices. We Republicans have made our choice. Have we had our arguments this year? Sure we have. You know what I call those? Signs of life. Signs of a party that's not just going through the motions, not just mouthing new words for the same old stuff. Meanwhile, what choice has the other party made in this incredible year filled with so many surprises? Here we are, at a time when men and women in both parties so clearly, so undeniably want a big change in direction for America, a clean break from a failed system. And what does the Democratic Party establishment offer? What is their idea of a clean break? They are offering a third Obama term brought to you by another Clinton, and you're supposed to be excited about that. For a country so ready for change, it feels like we've been cleared for takeoff and then somebody announced that we're all going back to the gate. It's like we've been on hold forever, waiting and waiting to finally talk to a real person and somehow we've been sent back to the main menu. Watch the Democratic Party convention next week, that four day infomercial of politically correct moralizing, and let it be a reminder of all that is at stake in this election. You could get through four days of it with a little help from the mute button, but four more years of it? Not a chance. Not a chance. Look, the Obama years are almost over. The Clinton years are way over. 2016 is the year America moves on. From now to November, we will hear how many different ways progressive elitists can find to talk down to the rest of America, to tell the voters that the Obama years have been good for you, that you should be grateful and well now it's Hillary's turn. The problem is really simple. The problem here is very simple. There is a reason people in our country are disappointed and restless. If opportunity seems like it's been slipping away, that's because it has, and liberal progressive ideas have done exactly nothing to help. Wages never seem to go up. The whole economy feels stuck and for millions of Americans, millions of Americans, middle class security is now just a memory. Progressives like our president like to talk forever about poverty in America, and if high-sounding talk did any good, we'd have overcome those deep problems long ago. This explains why, under the most liberal president we have had so far, poverty in America is worse, especially for our fellow citizens who are promised better and who need it most. The result is a record of discarded promises, empty gestures, phony strawman arguments, reforms put off forever, shady power-plays like the one that gave us Obamacare, constitutional limits brushed off as nothing, and all the while, dangers in the world downplayed, even as the threats go bolder and come closer. It's the last chapter of an old story. Progressives deliver everything — except progress. Yet we know better than most. We know better than to think that Republicans can win only on the failures of Democrats. It still comes down to a contest of ideas, which is really good news, ladies and gentlemen, because when it's about ideas the advantage goes to us. Against their dreary backdrop of arrogant bureaucracies, pointless mandates, reckless borrowing, willful retreat from the world and all that progressives have in store for us, the Republican Party stands as the great enduring alternative party. We believe in making government as Ronald Reagan said — not the distributor of gifts and privilege but once again the protector of our liberties. Let the other party go on making its case for more government control over every aspect of our lives, more taxes to pay, more debt to carry, more rules to follow, more judges who make it up as they go along. We in this party — we are committed to a federal government that acts again as a servant, accountable to the people, following the Constitution and venturing not one inch beyond the consent of the governed. We in this party offer a better way for our country, based on fundamentals that go back to the founding generation. We believe in a free society, where aspiration and effort can make the difference in every life. Where your starting point is not your destiny and where your first chance is not your only chance. We offer a better way for America, with ideas that actually work. A reformed tax code that rewards free enterprise, instead of just enterprising lobbyists. A reformed healthcare system that operates by free choice instead of by force and doesn't leave you answering to cold, clueless bureaucrats. A renewed commitment to building a 21st century military and giving our veterans the care that they were promised and the care that they earned. And we offer a better way for dealing with persistent poverty in this country, a way that shows poor Americans the world beyond liberal warehousing and check-writing, into the life everyone can find with opportunity and independence. The happiness of using your gifts and the dignity of having a job, and you know what, none of this will happen under Hillary Clinton. Only with Donald Trump and Mike Pence do we have a chance at a better way. And last, last point. Let the other party go on and on with its constant dividing up of people. Always playing one group against the other as if group identity were everything. In America, aren't we all supposed to be and see beyond class, see beyond ethnicity or all these other lines drawn that set us apart and lock us into groups? Real social progress is always a widening of the circle of concern and protection. It's respect and empathy over taking blindness and indifference. It's understanding that by the true measure we are all neighbors and countrymen, a call to each one of us to know what is kind and just and to go and do likewise. Everyone, everyone is equal. Everyone has a place. No one is written off. Because there's worth and goodness in every life. Straight from the Declaration of Independence, that is the Republican ideal, and if we won't defend it, who will? So much, so much that you and I care about, so many things that we stand for are in the balance in this coming election. Whatever we lack going into this campaign, we should not lack for motivation. In the plainest terms I know, it is all on the line, so let's act that way. Let's act that way. Let's use the edge we have because it is still what earns the trust and the votes. This year of surprises and dramatic terms can end in the finest possible way. When America elects a conservative governing majority, we can do this, we can earn that mandate if we don't hold anything back, if we never lose sight of the stakes, if we never lose sight of what's on the table. Our candidates will be giving their all, they'll be giving their utmost, and every one of us has got to go and do the same. So what do you say? What do you say? What do you say that we unify this party? What do you say that we unify this party at this crucial moment when unity is everything? Let's take our fight to our opponents with better ideas. Let's get on the offensive and let's stay there. Let's compete in every part of America and turn out to the polls like every last vote matters because it will. Fellow Republicans, what we have begun here, let's see this thing through. Let's win this thing. Let's show America our best and nothing less. Thank you, thank you and God bless.